Robyn was born in Townsville and she was raised in small Queensland country towns. There were no cinemas or television and so books, creative play, exploring and daydreams filled her world. Her love of books and reading has been with her all her life, but five years ago she had an experience that set her on the path to her latest, greatest passion: writing. As a Pyjama Angel with the Pyjama Foundation reading to children in foster care, she discovered the extraordinary power of children’s picture books one afternoon. One small book changed the world of a little five-year-old boy who realised, for the first time, that he could read. The book was Hug by Jez Alborough. Robyn now lives in Brisbane with her husband and their black and white moggy, Jazzie. They have two sons and four grandchildren. 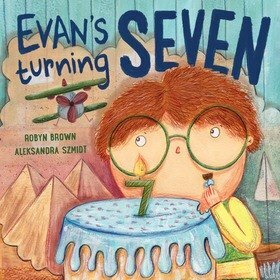 Evan’s Turning Seven is Robyn’s first children’s picture book, which tells the story of a small boy brimming with unbelievably brilliant birthday ideas. She is a member of the Queensland Writer’s Centre, Write Links and Share Your Story Australia.